Every time I return from a trip to the ocean I find that my landlocked house, which I usually love, is missing a crucial dimension and I long for the sea. Owl's Head at high tide, oil on panel, 5" x 7"
We kayak around this rock formation called owl's head every year, but only this time did we really see the owl--or what we think is the owl. 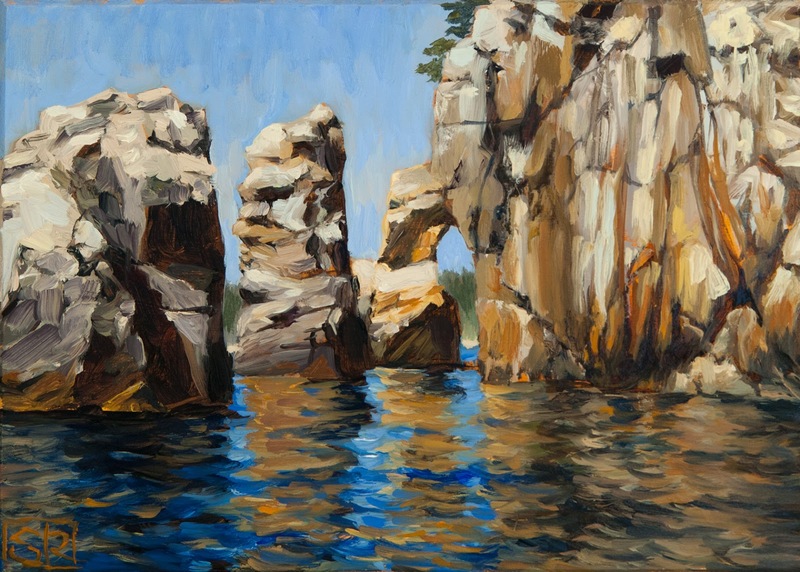 It's really only obvious from a kayak's vantage point between the cliffs (and is not visible in this painting of the spot). Last time we were lucky enough to see Black Guillemot chicks high on a rock ledge keening their raspy calls and getting ready for their first plunge into the sea below. This time we didn't see or hear any of the Guillemots, although I did spot a solitary chick swimming in the cove where we stay. I keep venturing into landscape in small ways, but I think I might paint a larger studio version of this painting sometime in the future, if only to conjure up the ocean from my land bound studio.